Here's a fun summer thank you card by Stephanie Muzzulin! She used the citrus slice from the Sweet Summer stamp set and paper pierced it in fun little patterned papers. I love the subtle prints! She added it to a fun tag to make this lovely clean and simple card! 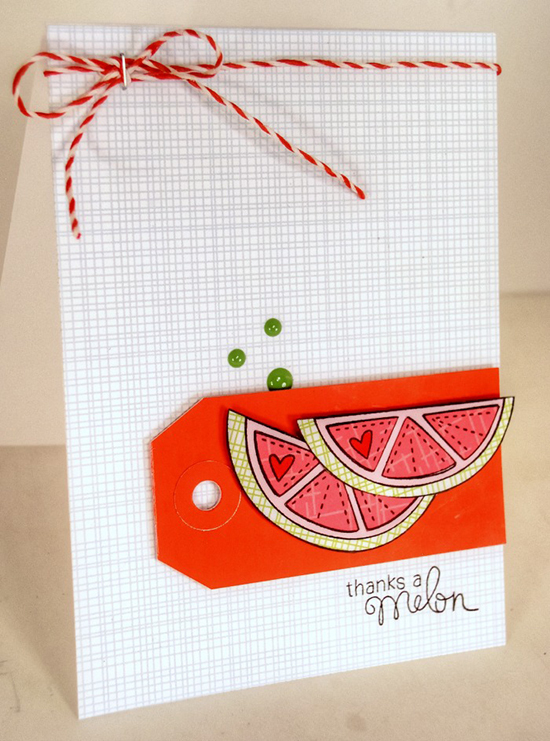 The "thanks a melon" sentiment is also from the Sweet Summer stamp set. What a yummy summer card! Head over to Stephanie's blog, Handmade Creations by Stephanie to see more of her awesome cards! 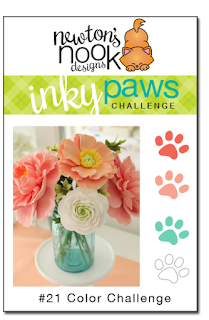 There's still time to enter our Inky Paws challenge #21 Color Challenge! Have you checked out our latest challenge? You have until Friday, June 12th at Midnight CST time to enter our current inky Paws Challenge. All you need to do is create a card or project based on this color combo of Coral, Peach, Mint and White and using & NND products! The winners of this challenge will get a $10 gift card to our shop! You can view full details and link up your card to our Inky Paws Challenge on this post. If you don't own a NND stamp set yet you can still play along - just download and use one of the digital freebies on our freebies page. This is so cute! I agree with Shannon...the staple on the twine is a fun touch! Such a sweet card! Love the little staple on the bow, really cute detail! Love the crisp design of this card! Winners of Be Inspired Class! Birthday Wishes and Snail Mail! Inky Paws #21 - Color Challenge Winners! Happy Anniversary card by Crafty Math-Chick!